Home|TBI makes a splash! 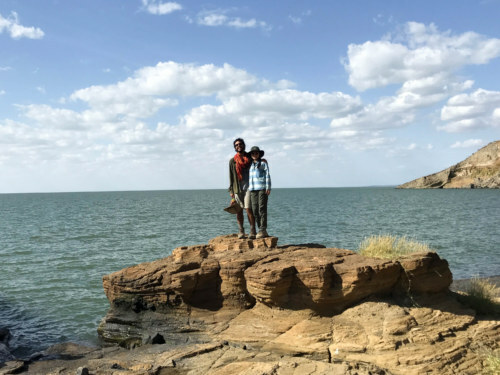 Visiting Lake Turkana. 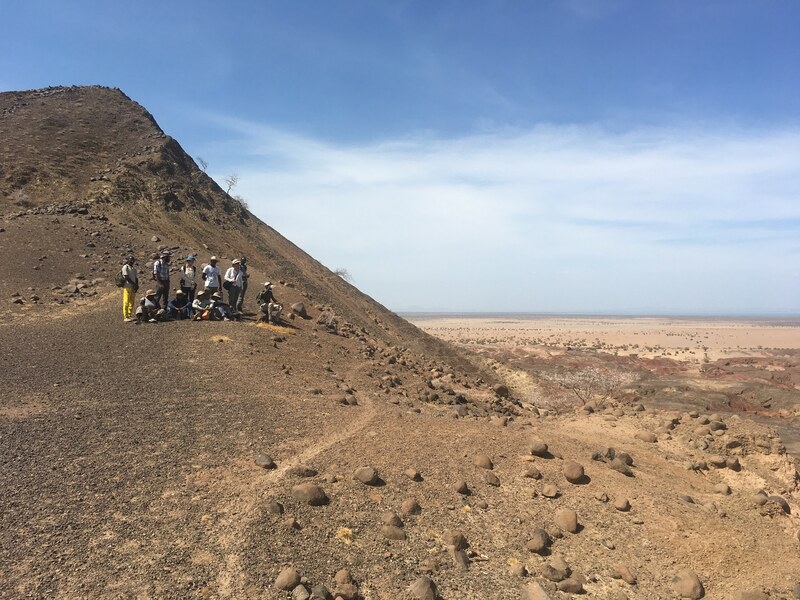 It can get pretty hot here in Turkana, so this weekend the students made two separate trips to the massive East African rift lake to cool off and take a well-deserved break from their first module. 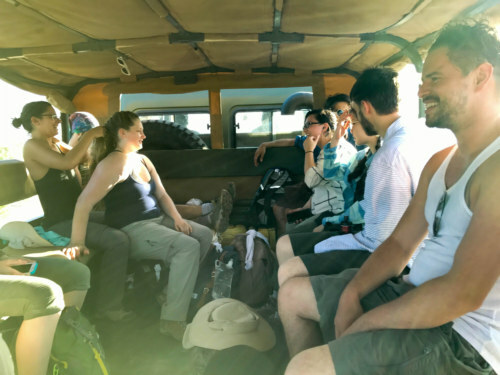 On Friday and after a week full of lectures, lab activities, and assignments, the whole group loaded up in the truck (or the “lorry” as it is called here) to begin the trip to Central Island. 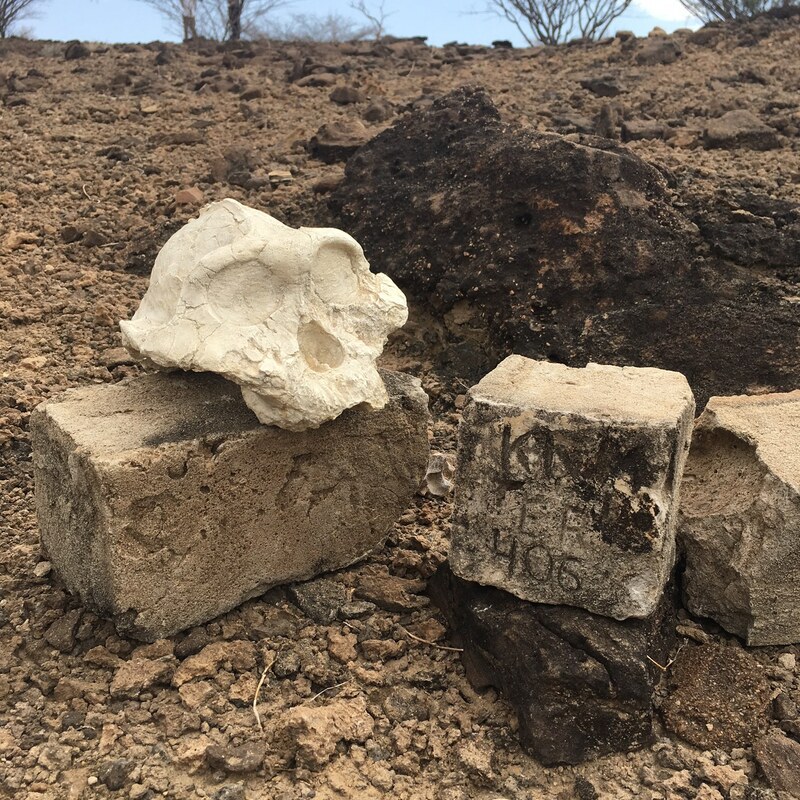 The Great Rift Valley of East Africa is formed by the splitting of tectonic plates, which has created a huge gash in the earth running from north to south through Kenya and the neighboring countries (which is phenomenal geology for preserving fossils and archaeological material!). 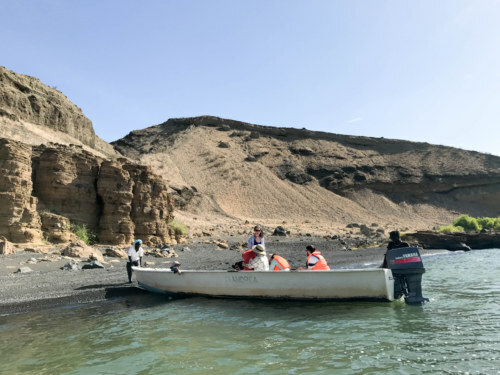 Because water always finds the lowest point, Lake Turkana is located at the center of the rift, with three volcanic islands (North, South, and Central) dotting the middle of the lake. 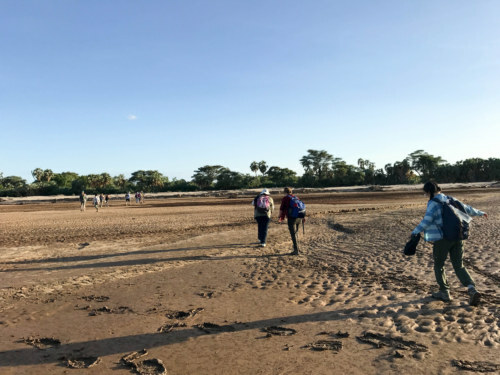 Central Island is a bit of a hike to get to — you have to cross the Turkwel river near campus, drive for several hours, take a boat, and then hike on the island — but everyone agreed that the long trip was worth it! 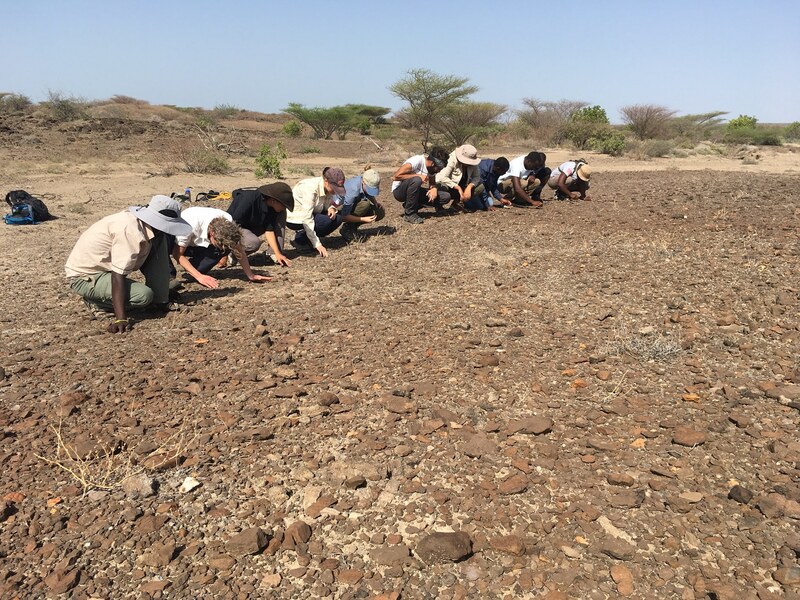 Students crossing the dry Turkwel river bed (photo credit: Evelyn Glaze). Students in the lorry during the drive from TBI campus to Kalokol (photo credit: Evelyn Glaze). 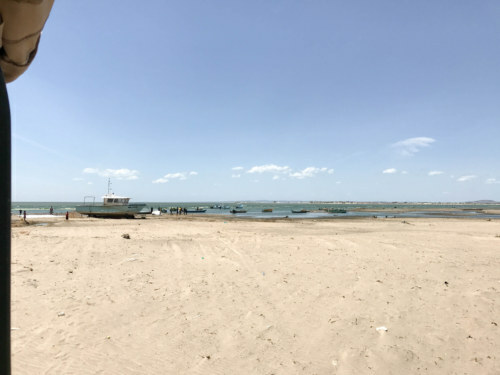 Lake Turkana with some fishing boats; our starting point for the boat ride to Central Island (photo credit: Evelyn Glaze). Crocodile Lake on Central Island (photo credit: Wensheng Liu). We woke up early to go to the island, but when we arrived in the town of Kalokol, the water was too choppy for us to take the boat out yet. While we waited for the wind to die down and the lake to calm, the students listened to music and caught a few winks in the shade of the lorry. After we were given the go ahead, we loaded up into two medium-sized fishing boats and began the aquatic part of our journey. The thirty-minute motor-boat ride splashed the students with a refreshing spray of lake water. 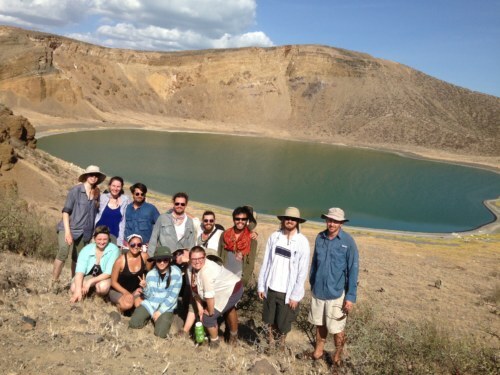 When we arrived on the island, we all hiked to the two beautiful crater lakes of the island: Crocodile Lake and Flamingo Lake. We saw about four crocs soaking in the lake of their namesake (from a comfortable distance! ), but unfortunately the flamingos weren’t present. Oh well, we will just have to all go back some day! The island was beautiful and a great way to take a break from classwork. 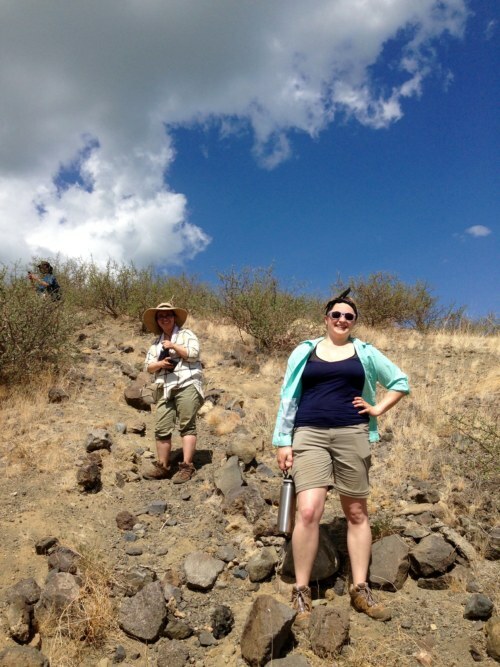 Adrienne and Kelly during the hike up to the view point overlooking Crocodile Lake (photo credit: Dorien de Vries). We reached the top! 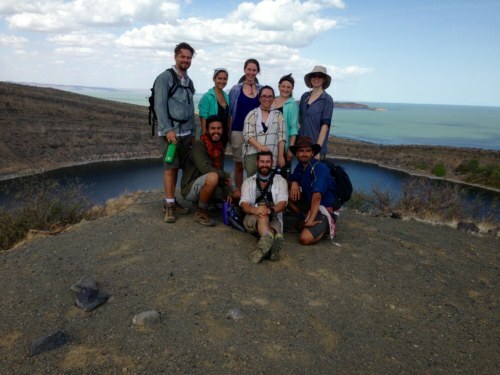 Students at the view point overlooking Crocodile Lake on Central Island (photo credit: Dorien de Vries). Ryan and Sheng on Central Island (photo credit: Evelyn Glaze). We reached another top! The whole group at the view point overlooking Flamingo Lake on Central Island. Back row from left to right: Karolina, TA Dorien, Evan, Morgan, Ian, Ryan, Nathan, Dr. Lewis. Front row, from left to right: Kelly, Petra, Sheng, partially hidden Adrianne, TA Evelyn (photo credit: Dorien de Vries). 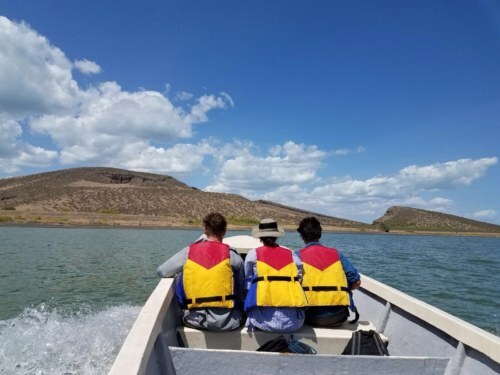 One group of students in the boat getting ready to leave Central Island (photo credit: Evelyn Glaze). 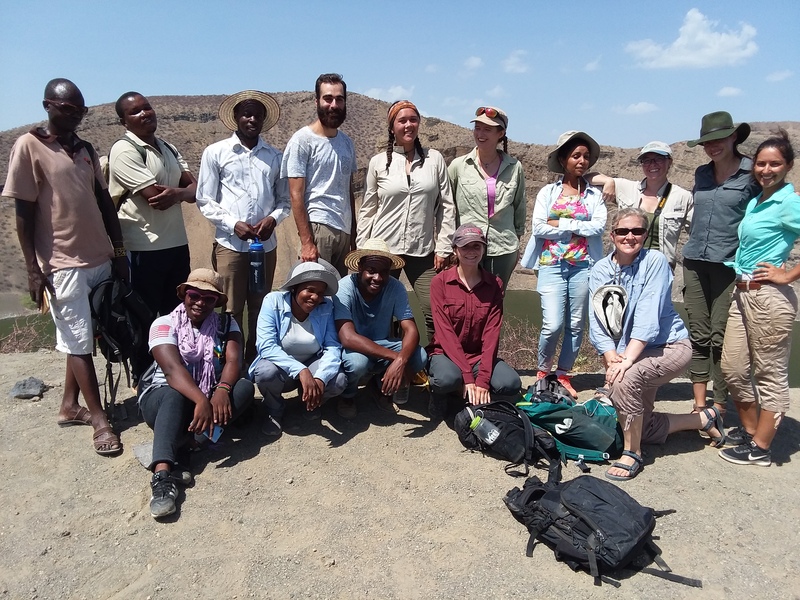 After the trip to Central Island, the students had one more day of lectures before they all bunkered down to study for their module 1 final exam (Environments, Ecosystems, and Evolution). Everyone studied hard and ended up scoring excellent grades! 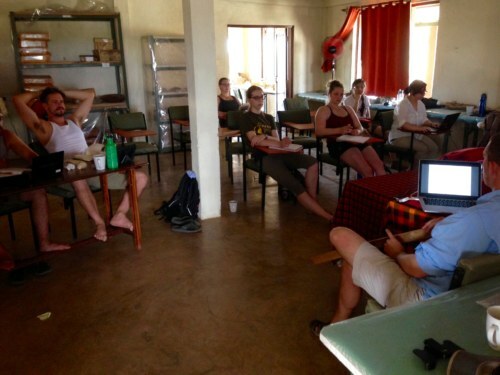 Dr. Lewis lectures on ‘Environments, Ecology, and Evolution’ on the last day of the first module (photo credit: Dorien de Vries). Students’ dorm at Turkwel TBI Campus (photo credit: Evelyn Glaze). Morgan, Ian, and Petra relax in the dorms after class (photo credit: Dorien de Vries). 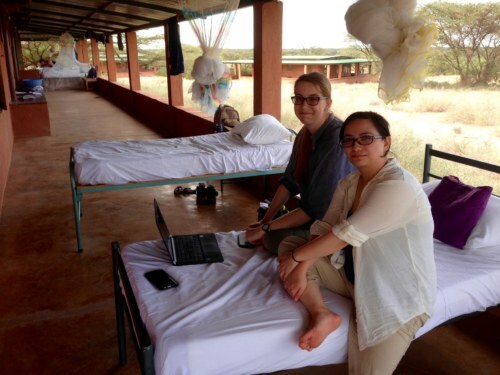 Karolina and Adrianne relax in the dorms after class (photo credit: Dorien de Vries). 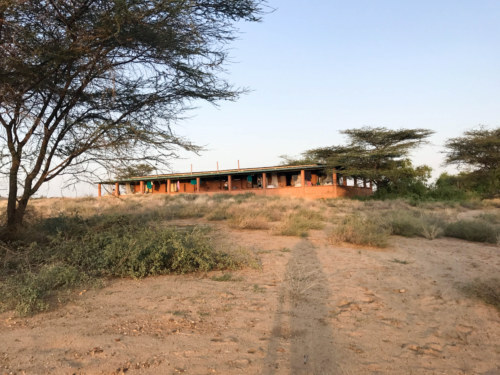 TBI Turkwel Campus right before the final exam for the first module ‘Environments, Ecosystems, and Evolution’ (photo credit: Dorien de Vries). 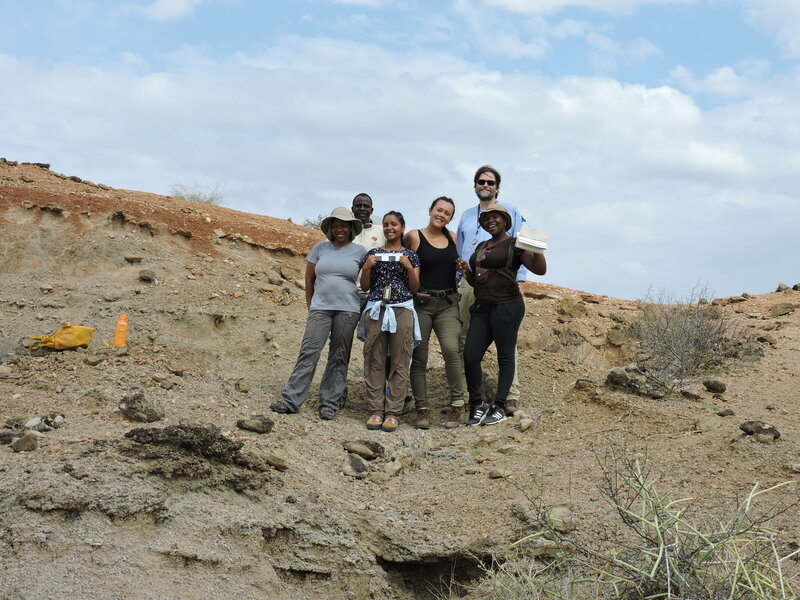 As a reward and celebration for ending their first module, we returned to Lake Turkana. This time, however, we had no intention of hiking or even breaking a sweat! We spent the majority of the day at Eliye Springs, a small beach resort, for shade and swimming. The students had a fantastic time relaxing in the cabana and wading in the cool water. They played Frisbee with some local kids who were also swimming in the water, which was tons of fun and led to much loud and freeing laughter. The outing allowed everyone to relax and recharge, and when we returned to TBI that evening, everyone was itching to get started on the next module. Archaeological methods here we come! 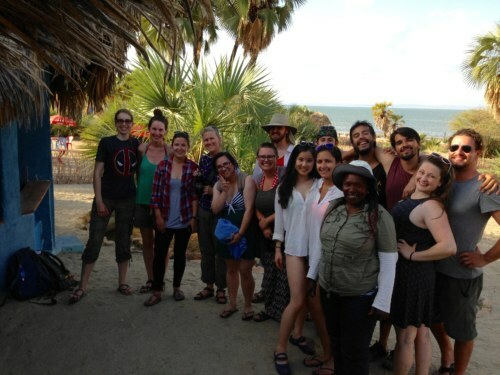 Students at Eliye Springs after a day of relaxing at the beach (photo credit: Dorien de Vries).